In temperate forests, soils contain a large part of the ecosystem carbon that can be partially lost or gained upon global change. Our aim was to identify the factors controlling soil organic carbon (SOC) stability in a wide part of French forests. Using a set of soils from 53 French forest sites, we assessed the effects of depth (up to 1 m), soil class (dystric Cambisol; eutric Cambisol; entic Podzol), vegetation types (deciduous; coniferous) and climate (continental influence; oceanic influence; mountainous influence) on SOC stability using indicators derived from laboratory incubation, physical fractionation and thermal analysis. Labile SOC pools decreased while stable SOC pool increased with depth. Soil class also significantly influenced SOC stability. Eutric Cambisols had less labile SOC in surface layers but had more labile SOC at depth (> 40 cm) than the other soil classes. Vegetation influenced thermal indicators of SOC pools mainly in topsoils (0–10 cm). Mountainous climate forest soils had a low thermal SOC stability. 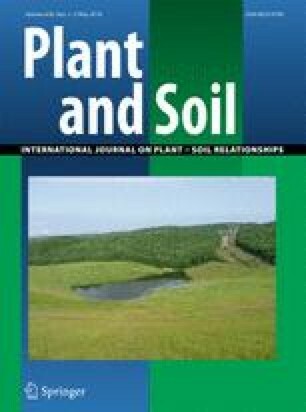 On top of the expected effect of depth, this study also illustrates the noticeable effect of soil class on SOC stability. It suggests that environmental variables should be included when mapping climate regulation soil service. The online version of this article ( https://doi.org/10.1007/s11104-018-3613-x) contains supplementary material, which is available to authorized users. This work was supported by the French Environment and Energy Management Agency (ADEME) [APR REACCTIF, piCaSo project] and Campus France [PRESTIGE-2015-3-0008]. We thank M. Bryant, S. Cecchini, J. Mériguet, F. Savignac, and L. Le Vagueresse for their technical support.